I love Paris…even in the rain! I had to really put my thinking cap on for this challenge. I didn’t even know whether it snows in Paris! So, my thoughts went to what I thought Winter was ~ and any-which-way I looked at it I couldn’t escape the rain! So my piece for you this month has Wintry colours and rain. The background uses purple and blue DI’s on an acrylic block that was lightly spritzed with water. Then placed onto some white card. and voila, that was my background. but I think it suits the card just the same. the stamping is done using masking to create layers. Then I also used masking of the inked area to stamp some drips…to add another couple of layers! In the end, this is a monochromatic one-layer piece. And, even with it’s simplicity, it is one of my favourite makes for this year! I hope you enjoyed this as much as me. This is brilliant Dot, love the rain drops, very cleverly put together! Mine to, simplicity at it's best. 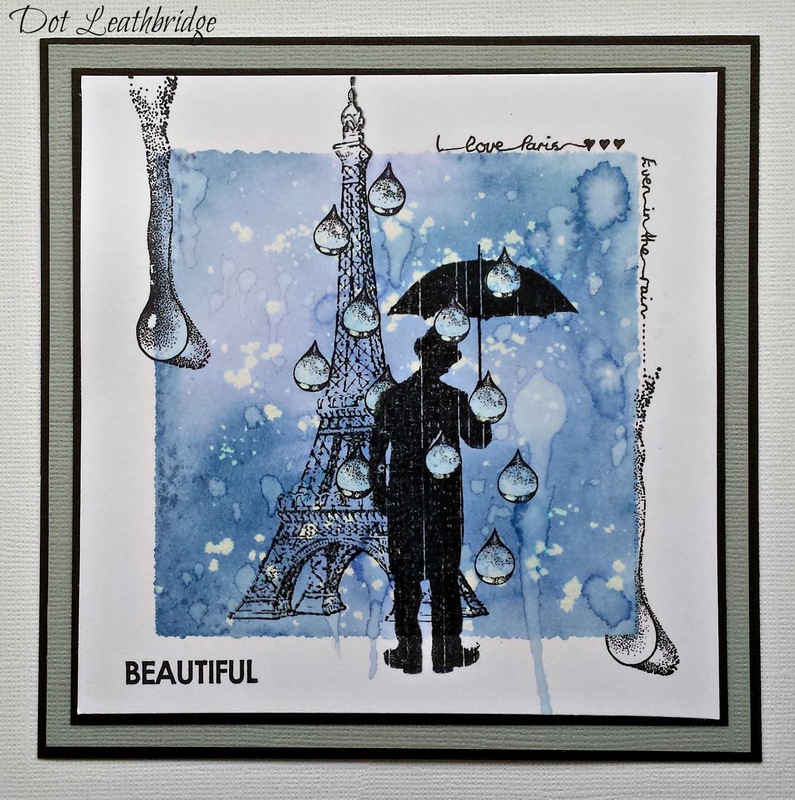 Wow this is a gorgeous project, love the raindrops and the stamps are great. One of my favourite pieces too, feels like you're looking out of a window on a rainy day. Love everything about this. Fabulous antipodean interpretation of Paris in winter, Dot!! And your writing suits the card perfectly 😉 Thanks for playing along at Craft Stamper! This is stunning, I love the design, a beautifully crafted card. Thanks for joining in the fun at Natalie and Amy's challenge this month. Thanks for joining us in the Craft Stamper challenge ! What a lovely, artsy scene. Congratulations for your win, your card is PERFECT and so beautiful!! Congratulations! What a beautiful card! Your card is just delightful! So happy for you! These images and colors are just fabulous together!!! This is absolutely brilliant – such a perfect combination of ink and stamping. super cool card – congrats on your TIMI win!